Henry Green, the brother of Val’s great great grandfather Fred Green, and was British Resident of the Orange River Sovereignty before going to Kimberley as a diamond prospector, and later becoming a farmer. His first wife, Margaret Aitchison, and their two children all died in 1860, and in 1862 he married Ida Carolina Johanna von Lilienstein, whose father was Count Carl Arthur von Lilienstein, who was a customs official in Holstein 1839-1848. He joined the British German Legion and led a party of 100 military settlers to Berlin in British Kaffraria in 1857. He returned to Germany in 1860 with his wife and youngest daughter, but Ida Carolina Johanna married Henry Green and stayed. Their daughter Ida Margaret Catherine Green (1865-1948) married George Arthur Montgomery Tapscott (1854-1918), and they had 10 children. The Tapscott boys: Back: Norman and Sidney. Front: Lionel Eric (Doodles); George Lancelot (Dusty); Cecil Leander. 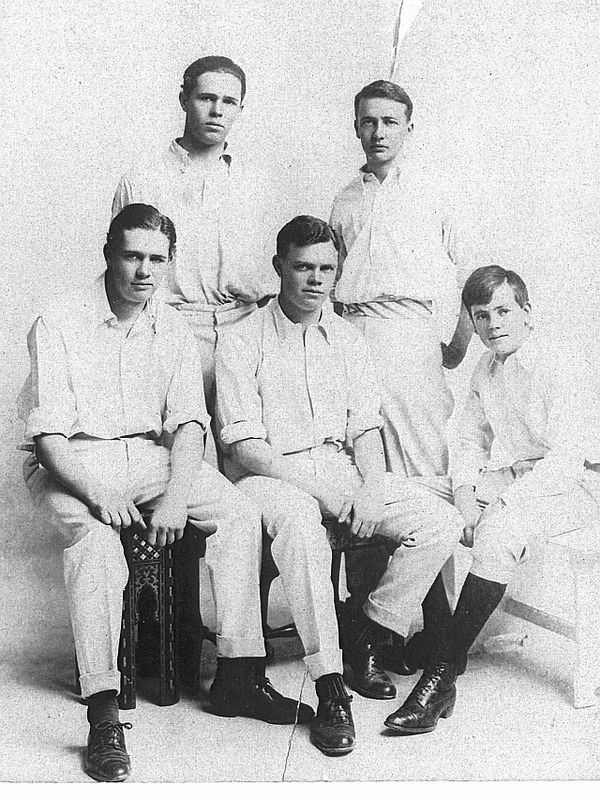 Several of the children made names for themselves in sport, with “Dusty” and “Doodles” both playing cricket for Griqualand West, and Eric Lionel “Doodles” Tapscott playing both cricket and tennis for South Africa. Ruth Daphne Tapscott was good tennis player and was a quarter finalist at Wimbledon, and the first woman to play at Wimbledon without stockings. 4 Dec 1835, Died ??? 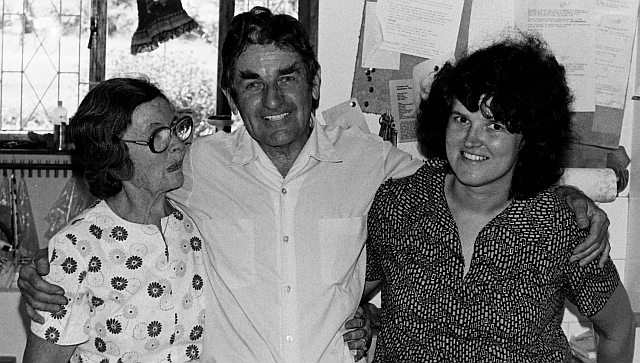 Most of our knowledge of the Tapscott side of the family came from Jack and Peggy Stokes, who stayed with us in Melmoth in 1979. Peggy was the daughter of Sidney Tapscott (seen in the picture above, taken about 1912. He became a mining engineer, and worked on the Nkana Mine in Zambia (then Northern Rhodesia). When the Kariba Dam was built, and began to fill with water a boat called The Ark was used to capture marooned wild animals and take them to safety. When the dam was full, and no more rescues were needed, Jack and Peggy bought The Ark and used it to take tourists for cruises on Lake Kariba. When they retired, they sold The Ark and bought a caravan, and travelled round Southern Africa visiting family and friends. Thus it was that they spent a few weeks in our backyard, and when we had time we pored over the family history documents we had. 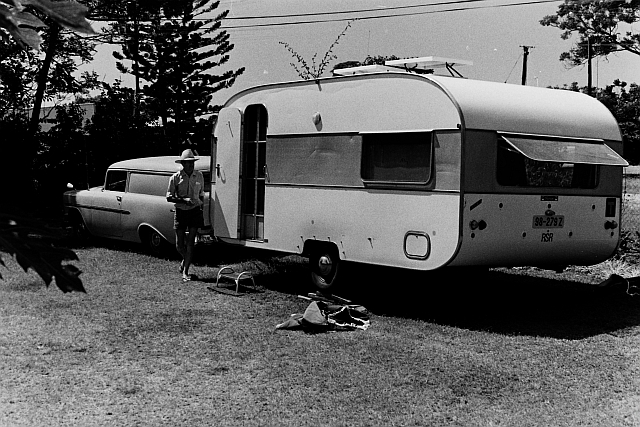 Jack Stokes with their caravan and the old 1956 Chev van they used to pull it, in our backyard in Melmoth, January 1979. Since then we have been in touch with a few more people on the Tapscott side of the family, and learnt a bit more. There are probably many more stories to be told, and people could use our Wikispaces pages to tell some of them, or start their own. Thank you, I have not seen that photo before. Well. I was glad to find this today. I am related to Hazel Christie Lotter (not Christine, but rather, a nod to her mother Agnes Christie), and it was good to find out just who her unnamed from my records “Tapscott spouse” was. Interesting family! Can you add any more details for her?